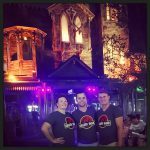 Mortem Manor is a Haunted Attraction located in Kissimmee, FL. Team Giraffic Shark reviewed this attraction on September 23, 2017. Mortem Manor, a year round haunt, delivers a strong attraction with a cast dedicated to creeping you out and delivering great scares. The attraction is filled with special effects, animatronics, and actors to send you running with fright. Easily accessible on a tourist strip, this haunt is open Wednesday through Sunday all year so it is always available for you to get your fill of fright. 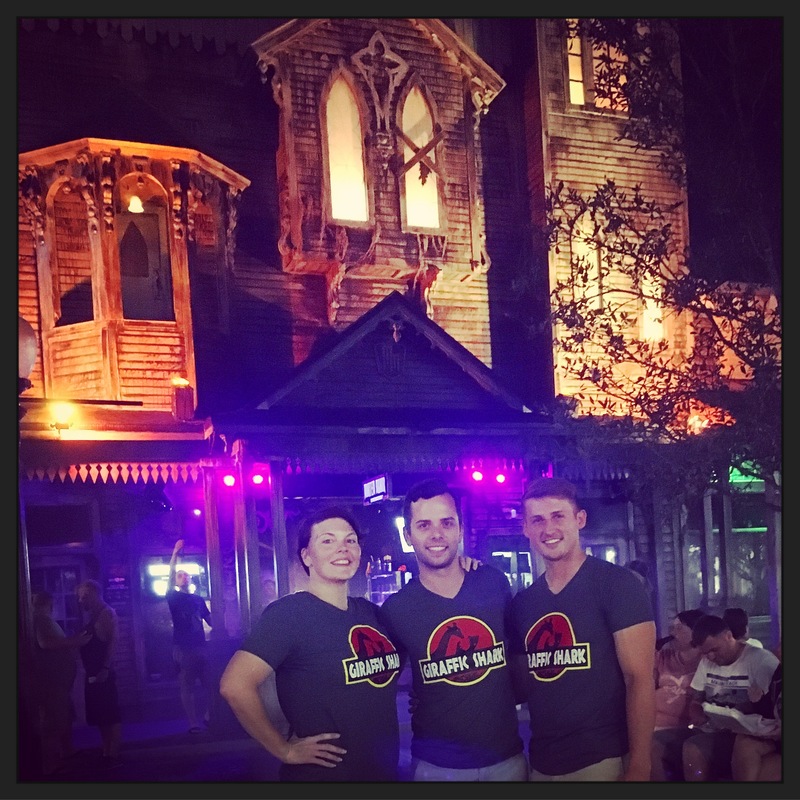 Visit during the Halloween season and take advantage of the combo pass including the additional Halloween area in Old Town, being built and operated by the folks at Mortem Manor. This will include free photo ops, three smaller haunted mazes and a lot of other fun! Enjoy these attractions separately or buy the combo ticket and get to experience Mortem Manor and Last Ride: Burial Simulator as well filled with movements, sounds, smells, all in a claustrophobic coffin as you are ‘buried alive’. The cast, while minimal, does a great job performing their roles in the attraction. The entrance performer serves as a host and does a great job reviewing the rules, regulations and guidelines. He also tells the overall story while guiding Guests through the first few rooms of the house telling the history of the house and setting up what lies ahead. The second performer encountered did a good job of forcing interaction and blocking the path to interrogate Guests prior to moving forward. This was a neat tactic to both pace Guests through the house and alter the natural forward moving pace in the attraction, creating uneasiness through her interactions and dialogue with Guests prior to moving on. The performer in the funeral room was great at creating personal interactions and riding the fine line of creeping Guests out and making them comfortably uncomfortable, all while distracting from the trigger scares placed throughout the room. While there aren’t enough performers through the house, the number of effects and trigger scares more than make up for the missing performers, and is a smart business decision given that this is a year round haunt that needs to stay operational despite quiet nights and seasons, where high labor costs would be counterintuitive. Mortem Manor does a great job at compensating for the lack of live actors with the amount of other effects and scare tactics throughout the attraction. While there aren’t many cast to costume here, Mortem Manor effectively costumes its characters so they fit in the environment and story. Since these actors have the ability to cover several different locations within the house, they are dressed in a nondescript way so as to have the flexibility to fit within several rooms’ themes. With different overlays and costume options, the cast of 4-6 makes it feel like there are at least over a dozen live actors in the attraction. In addition to costuming the live actors, it has to be mentioned that the costuming of static figures and animatronics is very well done also. Blurring the line between real and fake, the costuming helps pull off the illusion and overall theme leading to some great surprises, deception, and scares! Mortem Manor has the perfect Customer Service that I would want from a haunted attraction. During the visit, I got to experience Last Ride: Burial Simulator. Dennis Decay, the host for the experience was a phenomenal host through his great Guest service as well as his dark humor, wit, and sarcasm really taking the simulator experience to the next level. Even while I was inside the coffin, at the beginning and end of the experience I could hear him working the crowd that had gathered to watch the night vision camera live feed of myself in the coffin, (showing a prime view up my nostrils, I might add…a free fright for the crowd, I would say). The attraction, as advertised, does take place on two stories, but does include many staircases within the haunt, both full flights and short runs of 6-8 stairs as well. The stairs are well marked and there was never a safety concern or uncertainty involved while traversing these staircases. Some members of the team that were not directly in the front said it was difficult to see the stairs approaching, but as the first member leading the group, I found no challenge navigating the stairs safely. Because of the amount of stairs, besides not being handicap accessible, I would also not recommend the haunt to someone who can not handle many flights of stairs in less than 10 minutes. While there is not any moment where Guests are rushed through these moments, it may not be the most comfortable for some Guests depending on physical condition. This all being said, I have to reiterate that the Customer Service was exemplary at Mortem Manor. Tyler, owner, and our host for the evening, was most gracious and welcoming along with his entire staff. We felt welcomed, not rushed, and the experience was enjoyable from introduction to farewell. While the attraction takes place in Old Town, a combination of amusement park, gift shops, restaurants, bars, and other locations on the strip, you can’t miss Mortem Manor. The rather traditional looking haunted house sticks out (in a good way) on this strip. The odd angles, glowing boarded up windows, lighting, and fog create a perfect atmosphere for this haunt out of nowhere. Mortem Manor has the perfect combination of suspense, comedic relief, and haunted atmosphere to give this attraction the curb appeal it needs to draw Guests inside. Mortem Manor relies on Special Effects to deliver on many of the scares due to the lack of live actors in the haunt. Filled to the brim with creatively spaced animatronics, Mortem Manor does a great job of spacing the effects out so it never feels like they are expected or too close together. There are some effects that could benefit from some adjusted timing, but overall, they are triggered nicely to directly impact the majority of the group. Between sound effects, air cannons, and animatronics, the effects help deliver a good portion of the scares throughout the house. While some of these animatronics have been seen before in other houses, the usage of those props is unique to make some of the scares still unexpected, even for a haunt veteran. Scenes are detailed well to the point of not having a scene feel lacking of detail and props, but also not a high amount of props to require maintenance and replacing when things get broken and go missing from a year round crowd of Guests. Lighting is very effectively used in the haunt, giving several very dark transitions aiding in disorientation and suspense while highlighting key details and scares. Staircases felt light enough to safely navigate while still being dark enough to continue suspense and not create a total dead area. Perhaps the best use of lighting was the extremely disorienting strobe hallway. This effect massively played with depth perception and instilled a natural fear of what may be lurking in the hallway, hidden by the bright flashes. This blinding effect also helps the next several scenes as eyes work to adjust back to the dark conditions of the haunt. While not many truly original effects are used in the attraction, the combination and configuration of props, special effects, etc. are what make the attraction creative and original over all. The surroundings truly tell the story while the effects and animatronics seamlessly fit in and pack a punch when they need to. 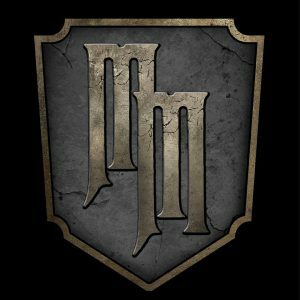 While being a rather traditional haunted house, Mortem Manor has a unique theme that is introduced in a different and fun fashion with an actor that brings you into the house and gives you a tour through the first few rooms while telling the history of the house and family involved. This is a unique and fun way to begin the journey through the manor as it sets up the story well. Nothing feels out of place and each room has a place in the story of Mortem Manor. Unlike other haunted house style attractions, the stairs really add here in creating the feeling of exploring a multi level house with overlapping floors giving some unique dimension to the haunt experience. There is really every different type of scare here within the walls of Mortem Manor. From characters that creep and disturb to jump scares the attraction gets you from every angle. Larger than life effects match with subtle simple effect scares. While there are only a few actors in the house at any given time, cleverly placed mannequins create the illusion of more actors and the anticipation never knowing who is lurking in the shadows and which one might reach out for you. Because of these setups in the attraction you begin to second-guess yourself and doubt where the line between reality and horror really is. While there are a bunch of scares that rely on special effects and animatronics, they are cleverly spaced and have enough variety to never get stale or expected. The dedication to variety and quantity of scares through the house is really great and maximizes the use of the live actors for when interaction is truly needed. Perhaps the most mind bending and impressive scare was in the strobe hallway where it seemed like a ghostlike figure appears and disappears before your eyes at the end of the hallway. The fact that you never come in close contact with this character nor the fact that he doesn’t attempt a close range scare helped to pull off this impressive and psychological scare. Mortem Manor, while very reasonable is also extremely successful due to its convenience and lack of a sustained queue to make your experience immediate. Within seconds of deciding to enter the house and making your purchase, you are inside and already beginning the experience. After around seven minutes of fun you are back on the street and don’t feel as though a single dollar has been wasted. The attraction sits right on par with the other attractions and rides in the area making it a reasonable addition to the Old Town and Fun Spot attraction area. Visit during the Halloween season and take advantage of the combo pass including the additional Halloween area in Old Town, being built by the folks at Mortem Manor. This will include photo ops, three smaller haunted mazes and a lot of other fun! Buy the combo ticket and get to experience Mortem Manor and Last Ride: Burial Simulator as well. We will definitely be back for the Halloween event, and year round whenever we need a little scary fix in the off-season!